This Oceanic Research Group educational film takes viewers under the ocean to look at a variety of planktonic organisms. It answers the questions "What are plankton?" and "Why are plankton important?" We made this film because very few films have been made about plankton. The reason for this is simple: plankton are hard to photograph and, let's face it, most people don't find them very exciting. In reality, plankton are fascinating--they comprise a wide variety of animals and plants from the microscopic to the immense, and they are the most important organisms in the oceans since they form the base of the food web. Without plankton, little else could survive in the oceans. Through stunning underwater video, stills, graphics, satellite images and microscopy, we have created a film which brings plankton into the classroom in an educational and entertaining way! You can even watch it for free here on this website! Buy this film on DVD or VHS! This Lion's Mane Jelly can reach 8 feet across and over a hundred feet long from the top of the bell to the tips of the venomous dangling tentacles. 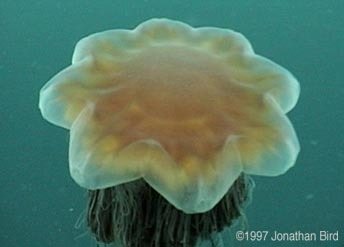 It is the world's largest jelly, and because it drifts, it is also plankton! 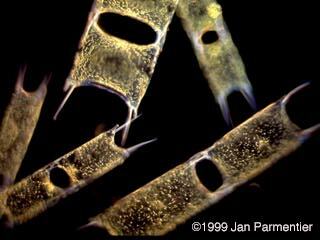 These strange looking organisms are diatoms, one of the most important kinds of phytoplankton. For more information about diatoms, check out Jan Parmentier's web site! Special thanks to: for hosting the streaming media!